(Nanowerk News) A new environmental chamber constructed by Argonne's Materials Science Division allows researchers to watch materials as they grow step-by-step while interacting in elevated-temperature, reactive-gas environments. The first experiment in the new chamber revealed intriguing information about how copper oxidizes at the nano-level and established a new basic model for understanding oxidation. The initial study found that clean copper surfaces are more resistant to oxidation than previously expected when exposed to oxygen. These findings could lead to improved electronic components. Industry is interested in using copper in some devices that are processed at high temperatures with oxygen present, but has been concerned that the copper might oxidize, leading to degraded electrical properties. The chamber may also help researchers find better ways to produce hydrogen from hydrocarbons. Oxides can be protective, as when alumina forms on aluminum surfaces, or damaging, as when iron rusts and fails. Understanding these processes at the atomic level will allow researchers to manipulate oxidation to create better materials. Oxide studies have traditionally been conducted on thick, mature oxide layers on bulk materials. More recently, transmission electron microscopy has revealed local oxidation processes at the mesoscopic level – the scale at which one can reasonably discuss the properties of a material or phenomenon without having to discuss the behavior of individual atoms. But the new environmental chamber permits X-ray diffraction measurements at Argonne's Advanced Photon Source (APS) to reveal oxidation at the atomic level – including chemical and microstructural evolution – in a controlled environment over a sample's entire surface. "Synchrotron X-rays are excellent for that," explained Jeff Eastman, MSD alloy oxidation group leader. "The X-rays penetrate the layers where the oxygen is reacting with the material's surface, and we can control the angle of the X-rays to either penetrate deeply into the material's surface or to provide exquisite sensitivity to just the top few monolayers." A monolayer is a one-atom thick structure. The APS, source of the most brilliant research X-rays in the Western Hemisphere, enables rapid measurements while the processes are occurring. The first environmental chamber experiments focused on copper. "We studied copper," Eastman said, "because it is an important material whose oxidation is still not fully understood. It is also attractive from a research standpoint because both copper and its most common oxide have simple, repeating cubic structures that simplify data acquisition and analysis." For this study, a thin film of copper was placed in the chamber, and both temperature and gas environment were controlled. 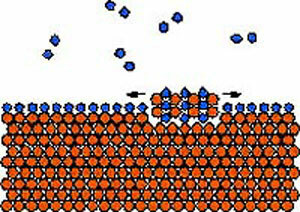 As oxygen was added to the chamber, it initially formed an ordered monolayer over the copper. "As the oxygen level increased," Eastman said, "it reacted with the copper, and small ‘nano-islands' of copper oxide appeared on the surface, resembling little hockey pucks about 100 nanometers wide and just a few nanometers thick." Once the islands formed, researchers varied the temperature and oxygen levels to study the islands' growth. Research revealed which conditions caused the islands to grow or shrink. Scientists determined the phase boundary – the dividing line that distinguishes between growing or shrinking – for several temperatures. "Compared to studies of bulk materials, the behavior we observed for copper oxide nano-islands are strikingly different," Eastman said. 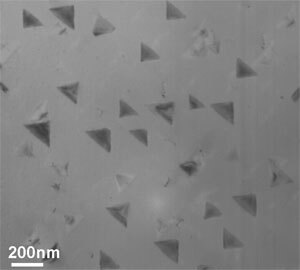 "These oxide islands that form at the beginning will actually shrink and disappear under conditions that would cause larger, bulk copper to grow." The research, which is funded by the U.S. Department of Energy's Office of Basic Energy Sciences, was carried out by a team of MSD scientists including Eastman, Dillon Fong, Paul Fuoss, Lynn Rehn, Guangwen Zhou, Pete Baldo, and Loren Thompson. The results, titled "Early-stage suppression of Cu (001) oxidation" were recently published in Applied Physics Letters. The chamber has been used at the APS BESSRC/XOR sector 12 beamline. The APS' high-energy X-rays are ideal for these studies since their penetrating nature enabled the team to design the chamber with chemically inert quartz walls that permit studying materials in hostile environments. The chamber is currently plumbed so that samples can be exposed to controlled mixtures of oxygen, argon, hydrogen, methanol, carbon monoxide, carbon dioxide or water vapor. The temperature can be maintained from room temperature to 1,000 degrees Celsius, and the gas pressure in the chamber can be adjusted over almost 10 orders-of-magnitude. Future studies are not limited to metal and alloy oxidation. For example, studies of the interaction of hydrocarbons with metal or oxide materials could help researchers develop more efficient ways to produce and store hydrogen. "With this new environmental chamber we also plan to study catalysis and other gas/solid interactions," said George Crabtree, director of Argonne's Materials Science Division.